Are you tired of hand applying your packing slips? Sick of folding and stuffing paper into flimsy plastic envelopes? Don’t want to open full cases just to put a packing slip inside? Need to speed up your order fulfillment? Take a look at FOX IV’s Quick Slip™ system! The Quick Slip system allows you to skip the insertion, skip the folding and stuffing, and skip the envelope. By thinking “outside of the box,” full case shipments no longer have to be opened to insert a packing list and shipping throughput increases due to a less labor intensive process. The unique Quick Slip™ system prints and applies a covert packing slip to the outside of the shipping container. HOW? 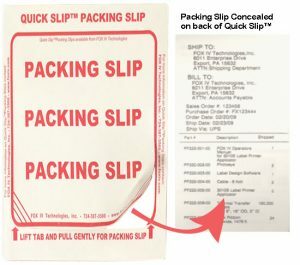 Well, the Quick Slip™ printer applicator prints on the liner side of a pre-printed packing slip label. The top side is boldly printed to identify it and indicates that the packing slip is hidden underneath. After the shipment contents are printed on the bottom side of the label, it is dispensed, the liner border is removed, and the label is automatically applied to the shipping container! Simple! 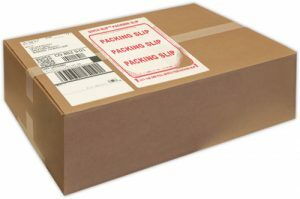 The packing slip information can be pulled directly from the order management software utilizing a scan, lookup, print and apply process that is commonly used to print and apply the shipping label, or from a local work station. FOX IV’s software experts can assist in integrating a Quick Slip™ system into existing production lines. If you already have a print and apply system to automate your shipping labels, why not add a Quick Slip™ system to automate your packing slips as well? Quick Slip™ labels come in a standard size and an extended size to accommodate a larger amount of products. Still want to apply manually only better? Ask us about Quick Slip™ labels for table top label printers.